Home > Shop By Brand > Griot's Garage Car Care for the Perfectionist > Griots Garage Speed Shine Detailer 35 oz. Griot's Garage Speed Shine Detailer is their most popular product because it makes your vehicle look fantastic with so little effort. This high lubricity detail spray removes the dust and debris that has accumulated since your car's last car wash in a matter of minutes. Your vehicle will look like you've just washed it. 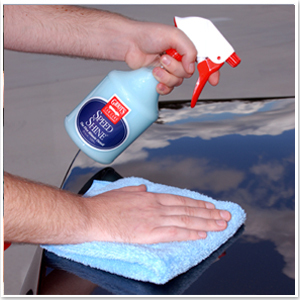 Slippery lubricants protect the paint from scratches as you wipe the paint clean. It's always easier to remove bird droppings as soon as they occur. Keep a bottle of Griot's Garage Speed Shine Detailer and a soft microfiber towel in your vehicle for emergency detailing. Just spray and wipe to detail your entire vehicle. Taking quick action will keep paint-etching debris from penetrating your vehicle's wax coating. Don't stop at the paint. Griot's Garage Speed Shine Detailer is safe and effective on wheels, chrome, and exterior plastic trim. Any painted, clear-coated, or plastic surface will instantly look cleaner. For the best results, use Griot's Garage Speed Shine Detailer with a soft, clean Griot's Garage Speed Shine Micro Fiber Cloth. This cloth has a deep nap to hold loose dirt away from the paint. When cleaning, work from the top down to avoid contaminating clean areas, and leave the dirtiest parts of the vehicle for last. Flip your micro fiber cloth as needed to a clean side. Griot's Garage Speed Shine Detailer enhances the shine of existing wax or paint sealant. Griot's Garage Speed Shine Detailer works best on a waxed vehicle. Use it between details to keep the paint looking clean and shiny. This detailer spray is far and away the best that I have ever used on my street rod and muscle car. I'm sold and won't be going back to the ordinary stuff found on store shelves every where. I have used Speed Shine for over 10 years. I use it on a regular basis for quick cleaning touch ups between car washes. I carry a Spray bottle of Speed Shine in the trunk when heading out of town. Product works amazingly with a microfiber cloth. ProsVery easy to apply and use with exceptional results. I donâ€™t know whatâ€™s in this stuff but itâ€™s been years since I used water and soap to clean my cars. This stuff takes off all the dirt and salt/chemicals without leaving any scratches. Simply a marvelous product. Now if you make it smell like bananas or some other nice aroma . . .
GG Speed Shine Detailer is my favorite product from Griot's Garage. It is excellent at removing light dust and finger prints, and it leaves the paint feeling slick and glossy.